US medal haul below expectations. 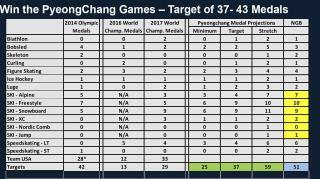 The US Olympic Committee had a target of 37 American medals for Pyeongchang, according to medal projections obtained by the AP, but the US has only 21, with 48 hours of action to go. But Alan Ashley, USOC's chief of sport performance, says there's more to the Olympics than medals. "I look at it and I go, 'OK, medals are one story, but if you look at the depth of everything that's going on, and the number of people who are fourth and fifth place, and the commitment level and intensity of the athletes, you can't ask for more than that," he says. Many of our kids are becoming sissies. No PE in our schools. Extra charges to participate in sports. Are these teachers really that dedicated to our kids? How about todays parents? How dedicated are they? Are we going to continue to encourage exceptionalism or accept and award the mundane. It took a lot of smart, determined people to create this country. Will this tradition continue? Make America Great Again! ! (words from our President) America/Americans must unite in this common cause.